Ann Arbor District Library board meeting (July 15, 2013): For the second consecutive month, the AADL board held its meeting at one of the district’s four branches – this time at the Pittsfield branch on Oak Valley Drive. Fifteen people spoke during public commentary, a much higher than usual number. About half of the speakers, including several children, were there to earn points in AADL’s summer game, and spoke about their appreciation for the library and for the game in particular. Codes, which can be used to collect points in the game, were given to anyone who showed up to the meeting or spoke at public commentary. Later in the meeting board members received a briefing on the game from Eli Neiburger, AADL’s associate director of IT and product development, who talked about its role in encouraging kids to read and write during the summer months. The board also was briefed on the recent Kids Read Comics convention, as well as new collections of non-traditional items – like home tools and microscopes. In his financial report to the board, Ken Nieman, AADL’s associate director of finance, noted that library ended the year about $43,000 under budget for tax revenue. That amount includes $37,000 from tax refunds that AADL had to make to the county and various municipalities throughout the year, following decisions made by local tax tribunals. AADL had expected to make $75,000 of such refunds, but refunds totaled about $112,000 for the fiscal year, which ended June 30. AADL director Josie Parker highlighted several staff accomplishments during her report to trustees, including news that an anonymous donor has given his classic video game collection to the library. The collection – which will be used for AADL events, but won’t be in circulation – includes cartridges and discs from the 1980s and ’90s, and a few game consoles. During public commentary, Bob Rorke – a consultant working for the Protect Our Libraries political action committee – raised questions about AADL’s decision earlier this year to hire Allerton-Hill Consulting. Referencing excerpts from emails that Protect Our Libraries obtained through a Freedom of Information Act request, Rorke argued that the consulting contract is not a generic communications audit or project – but rather it’s political. He indicated that Allerton-Hill provides political advocacy for the passing of public financing issues, and asked the board to review this contract and determine whether it’s legal under Michigan law. Public commentary also included thanks from Robb Wolfe, executive director of the Ann Arbor Summer Festival, for AADL’s ongoing support. Other topics raised by speakers touched on the condition of the downtown library, appreciation for events hosted by the library, and a report from the recent American Library Association conference. 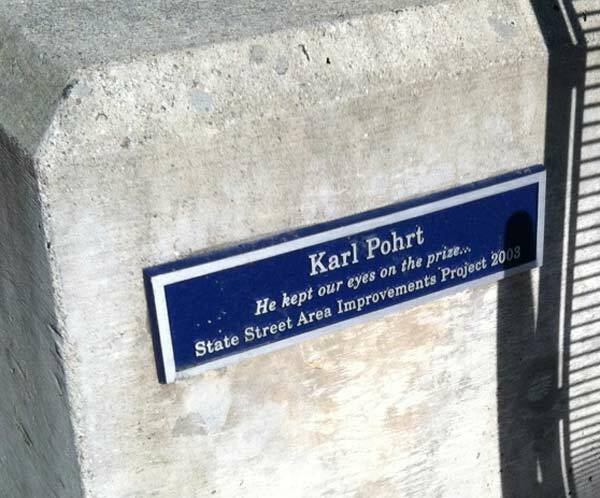 The meeting also included a tribute to Karl Pohrt, who died earlier this month. Trustee Ed Surovell, an avid book collector, noted that many people knew Pohrt as the founder and owner of Shaman Drum Bookshop in downtown Ann Arbor. “But he was so much more than that,” Surovell said. At the beginning of the meeting, board members amended their agenda to include an item paying tribute to Karl Pohrt, owner of the former Shaman Drum Bookshop who died on July 10, 2013 after being diagnosed with anaplastic thyroid cancer in October 2012. A plaque on South University honoring Karl Pohrt, whose business – Shaman Drum Bookshop – was located around the corner on South State. Pohrt was an enormous supporter of childhood literacy and community activities, hosting authors to speak at his bookstore, Surovell said. He was also a major supporter of downtown Ann Arbor, especially the State Street area where his shop was located. There was an enormous outpouring at a July 14 memorial service, Surovell reported, with people representing many generations and aspects of the community. Rosenthal recalled working with Pohrt on the Ann Arbor Book Festival, saying he had been a huge proponent of that. She thanked Surovell for suggesting that the board honor Pohrt through a resolution. 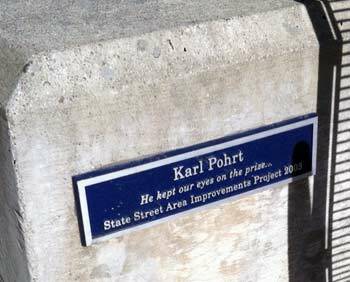 Outcome: The board unanimously passed a resolution honoring Karl Pohrt. Cheryl Orosz introduced herself and her daughter Samantha, describing the two of them as “avid summer game players.” They were attending to get the game points, she said, and to tell the board that they appreciate the opportunity it affords for community building and learning. Everyone in her family plays, she noted. Her husband attended the Townie Street Party that night to collect points, and her other daughter is at another program at AADL’s Malletts Creek branch. Her family has also created badges for other players to earn. It’s a great way to enhance search skills, she noted. “There are real life skills being developed,” Orosz concluded. 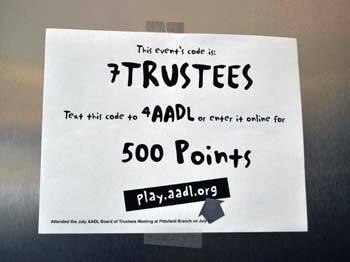 A sign with the code for collecting AADL summer game points for anyone who attended the July 15 board meeting at the Pittsfield branch. People who spoke during public commentary could get additional points. Yingchen Jin said she likes the library a lot “since I don’t have many chapter books of my own, and I love reading.” She likes going to libraries close to her home, and participating in the summer game. She is trying her best to get as many points as she can. Lydia Valtadoros told the board that she’s 11 years old and attends Slauson Middle School. She liked searching through the library’s catalog to find the codes so that she can earn points. Her 13-year-old brother, Philip Valtadoros, also goes to Slauson. He told the board that he loves the library and the summer game is his favorite program. “It’s like a big incentive for me to read over the summer.” He also likes the online game. He thanked the library for everything it offers. Elaine Cash expressed her thanks to the staff and board, saying that she and her children enjoy playing the summer games. As the mother of two kids, she’s always looking for activities in a kid-friendly environment, and there are always events going on at the library. “They’re free and always interesting,” she said, and she wanted to thank the board for that. Eli Neiburger, AADL’s associate director of IT and product development, gave an update on the summer reading game – called Play@AADL – as well as on the Kids Reads Comics convention hosted at AADL in June. The summer game still includes the classic paper game for elementary and middle school kids, he said. Kids read 10 books, getting stickers after finishing the third book and the eighth book. After they finish all 10 books, they get a real book to keep – courtesy of the Friends of the AADL, and the Scott & Marcy Westerman Fund. They also then get a “badge” and 1,000 points for the online game. The library has teen and adult paper games, too. As of that afternoon, 2,490 people had printed the teen game, and 3,684 had printed the adult game, Neiburger reported. AADL director Josie Parker’s catfish. Players of the summer game can get points by going to her office and finding the code in the catfish’s mouth. Parker brought the catfish to the July 15 board meeting. For the online version, players are four weeks into the 11-week game. About 2,800 online players have scored a total of over 20 million points so far. Out of that 20 million, 7 million points have been spent, he said. Points can then be redeemed at the “game shop” for T-shirts, caps, messenger bags and other items. There are over 450 game codes available, like those posted on the door to the room for the board meeting that night and at the public speaker’s podium. You can earn 76 different badges, each requiring different actions to complete. As an example, one series of badges is called “Airlines of Inquiry,” featuring now defunct airlines. One badge in the series is called The Line – named after the French airline “la Ligne.” That airline eventually became Aéropostale, “which teenagers are familiar with for a very different reason,” Neiburger joked. [It's the name of a popular clothing store.] It was also the airline that Antoine de Saint-Exupéry worked for as a pilot before he wrote “The Little Prince.” He was inspired to write the book during one of his flights for this airline. There are these kinds of tie-ins to children’s literature all across the game, Neiburger said. 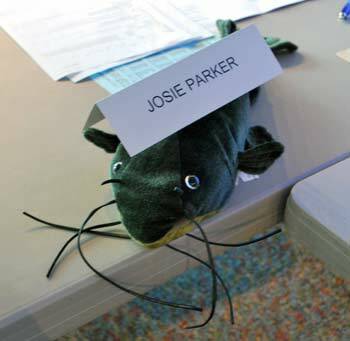 There’s also the “Josie’s Catfish” badge that you get by going to the office of AADL director Josie Parker and finding the code in a stuffed catfish toy that she keeps there. 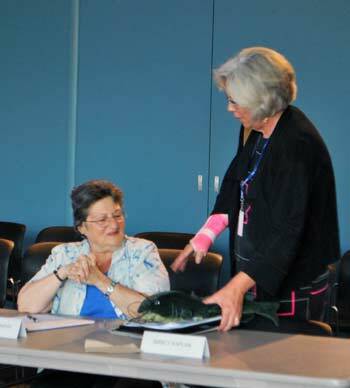 She brought the catfish to the board’s July 15 meeting. Neiburger also described the Kids Read Comics convention, which AADL hosted for the second year in June. As an all-ages comics convention, it’s unique because most comics conventions are expressly not for kids, he said. In contrast, Kids Reads Comics “is not just for kids, but there’s nothing that isn’t appropriate for kids, and that’s a very, very powerful opportunity.” It was produced by local cartoonist and teaching artist Jerzy Drozd; Dan Merritt, owner of Green Brain Comics in Dearborn; and comic book writer Dan Mishkin, whose work includes the DC Comics characters Amethyst and Princess of Gemworld. AADL will host the conference again next year, Neiburger reported, although a date hasn’t yet been set. It’s wonderful to see kids reading comics that really push them beyond their literacy levels, he said, because it gives them context they can use to understand the words that might be beyond their reading level. Josie Parker noted that the Kids Read Comics convention was the AADL’s contribution to the Ann Arbor Book Festival, which didn’t have a separate children’s program this year. Celeste Choate – AADL associate director of services, collections and access – gave an update on the library’s collections of unusual, non-print items. She had given a similar briefing at the board’s Jan. 16, 2012 meeting. Celeste Choate, standing, talks with Sheila Rice (left) and Lyn Davidge (right) before the start of the July 15, 2013 meeting of the Ann Arbor District Library board at the Pittsfield branch. Choate is AADL’s associate director of services, collections and access. Choate began by reviewing some of the history of this type of collection, noting that the Ladies Library Association has for many years donated funds to the AADL to buy art books. Currently, there are about 1,500 such books in the collection. The books were so popular that AADL was inspired to start an art print collection, which includes work by local artists. It’s on the third floor of the downtown library, as well as displayed on the library walls. The catalog of prints is online, so that it’s easily searchable. Given the popularity of the art print collection, over the years the library staff has looked for other non-traditional items to circulate. The collections are listed in “Unusual Stuff to Borrow” on AADL’s website. Choate’s presentation highlighted the newest categories: kids “book clubs to go,” home tools, science tools, and Up for Grabs. 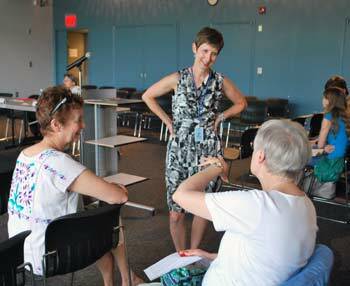 The library has offered adult “book clubs to go” for several years, Choate said, and they’ve now done it for kids too. Each “to go” bag includes 10-12 books, a DVD if the book has been made into a movie, as well as possible discussion questions. It allows parents, teachers and kids to create a book club easily, she said, and enjoy the community experience of talking about books. The collection of home tools launched in June, Choate reported, and includes a thermal leak detector, an 8-outlet wireless energy meter, and indoor air quality meter. These are items that might be too expensive for most people to buy for a one-time use. In the science tools collection, the library has added microscopes to its collection of telescopes. The items have been selected for their ease of use, Choate said, and include a stereo microscope and portable digital microscope. The Up for Grabs category is an attempt to make AADL’s collections more accessible, Choate told the board. A few of the more popular items can be set aside to be available for walk-in patrons only, to give them immediate access. Items in the Up for Grabs category can only be checked out for a week, however. The same items that are in the regular collection and that can be reserved are available for a two-week checkout period. The Up for Grabs items that are offered can vary, giving the staff flexibility in this category. “We’re trying this out to see how this model works,” she said. Different libraries across the county offer different collections, Choate said, based on their communities. Some libraries have Halloween costumes that can be checked out, for example, or puppets or specialized baking pans. In response to a query from Barbara Murphy, Choate said AADL staff don’t think baking pans would circulate well in this community. AADL director Josie Parker added that there’s another issue – public health standards. Before adding a collection, the AADL staff thinks about how it would fit within this community, Choate explained, and whether the collection can be sustained. Choate said the next non-print collection, launching soon, will relate to dinosaurs. The library has an unrestricted cash balance of $8.019 million, and has received almost 100% of its tax revenue, totaling $11.2 million. The AADL fund balance is $8.2 million. Three items are over budget for the year ending June 30, he noted: utilities, communications and software. The board made some budget adjustments at its June 17, 2013 meeting based on estimates that turned out to be too low. Nieman said the board will be asked to make additional adjustments to the previous year’s budget at its August meeting for these three line items. The library ended the year about $43,000 under budget for tax revenue, Nieman reported. About $6,000 of that is from tax revenue that the library hasn’t yet received. The remaining $37,000 is from tax refunds that AADL has made to the county and various municipalities throughout the year, following decisions made by local tax tribunals. AADL had budgeted for $75,000 for those refunds, but that line item is coming in at $112,000 for the year. There was no discussion among board members about this financial report. Josie Parker began her report by noting that the Tribeca Film Institute director has again asked AADL to partner on a project, this time focusing on immigration. The library had previously worked with Tribeca on the national “America’s Music” project. Tim Grimes, AADL’s community relations and marketing manager, and Eli Neiburger, AADL’s associate director of IT and product development, will serve on an advisory group representing public libraries. Parker said she was proud that they had been asked to participate a second time. From left: AADL trustee Barbara Murphy and library director Josie Parker. Parker also reported that for years during the week of art fairs, the library has set things up so that no checked-out items are due during that time period – so if you can’t make it to the downtown library because of traffic or a lack of parking, you don’t have to worry about whether the items you checked out are overdue. In addition, any requested item can be picked up at any of the branches, so it’s not necessary to come to the downtown library on South Fifth Avenue, in the heart of the art fairs. The hold period is extended so that items will stay on reserve until after the art fairs are over. In other news, the library has received two “family favorite” awards from the Ann Arbor Family magazine, Parker reported. The library was voted as having the best “free” activities and the best story hour. The library also received a certificate of appreciation from the Michigan Prisoner Re-Entry Initiative (MPRI), for AADL workshops given to people re-entering the workforce after prison. Parker cited Ira Lax and Beth Manuel of the AADL staff as being instrumental in that partnership. Parker told the board about a couple of gifts the library recently received. Elaine Wilson donated a painting she’d made of construction at West Delhi bridge over the Huron River near her home in Dexter. Wilson thought kids would like it, Parker reported, so the painting will eventually be displayed at the Pittsfield branch. Another gift was made by a donor who wants to remain anonymous. He donated his “classic” video game collection, with the understanding that it won’t be available for library check-out. Parker called it a significant collection. These are mostly cartridges and discs from the ’80s and ’90s, and a few game consoles. They will not be available for checkout. We’ve added this collection to our kit of event equipment and it will be used for our ongoing retro gaming events, open play, and classic game tournaments. Some examples include an extensive collection of Atari VCS (2600) cartridges and controllers, Nintendo and Super Nintendo cartridges, near-complete runs of the Sega Dreamcast and Panasonic / Matsushita 3DO game libraries, and a Nintendo Virtual Boy with all 14 known Virtual Boy games. This stuff is fun to try and will make for many fun library events yet to come; young gamers get a kick out of our old school ways and it’s also a powerful dose of nostalgia for older players. If it turns out that there’s anything rare in the collection (we’re still going through it), we have the ability to transfer items to the University of Michigan Computer and Video Game Archive or other similar archival/museum collections if those would be better homes for some of the items. Finally, some work has been done at the downtown library over the past couple of months, Parker said. On the second floor on the former reference side, a few years ago the library installed a “laptop bar” where computer users can plug directly into the library’s Ethernet connection. It’s been very well used, Parker said, so some empty vertical file cabinets were removed and that laptop bar has been expanded with eight new seats. About 10-12 people can now be accommodated there, she said, depending on how close people want to sit next to each other. After Parker’s report, trustee Margaret Leary highlighted one of Parker’s own recent accomplishments. Joe Janes, a leading educator who formerly taught at the University of Michigan, recently edited a book titled “Library 2020: Today’s Leading Visionaries Describe Tomorrow’s Library.” It’s a collection of 24 commentaries on different subjects about the future of libraries. Parker wrote an essay that’s included in the section on leadership and vision. Leary recommended the book to anyone who’s interested in the future of libraries, and read aloud the first sentence from Parker’s essay: “The library in 2020 will offer a culture of generosity supported by fiscal oversight that reflects rigorous controls and realistic projections.” Leary indicated that this is a philosophy that Parker uses to guide the library now as well. In response to a query from Barbara Murphy, Parker said the book will be available at AADL but it hasn’t arrived yet. It’s published in print and as an e-book. Parker also noted that the book includes an essay by Peter Morville, who lives in Ann Arbor. His essay is about inspirational architecture, which references public libraries. She noted that in talks he gives on this same subject, his slides include images of AADL’s Traverwood branch. The board has six committees: communications, budget and finance, facilities, policy, director’s evaluation and executive. Two of those – communications and facilities – were created as special committees at the board’s Jan. 21, 2013 meeting. On July 15, board members reported that none of the committees had met since the last board meeting, and there were no updates. The board meetings have two opportunities for public commentary – at the beginning and end of each meeting – as well as time for various communications from the board. In addition to commentary reported above, here are some highlights. Bob Rorke continued a topic that he’s spoken about at previous meetings: AADL’s $28,000 contract with Allerton-Hill Consulting. 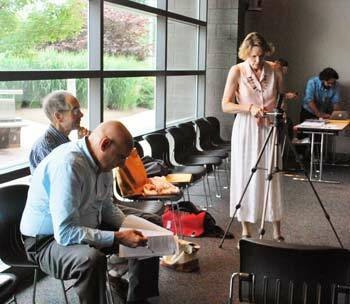 From left: Bob Rorke, Doug Jewett and Kathy Griswold, who videotaped the July 15 meeting. During the July 15 public commentary, Lou Glorie followed Rorke and read a portion of his written statement, describing references provided by Allerton-Hill to the AADL, which had been included in a January 2013 email. The four references provided by Allerton-Hill were previous clients – including three school systems – that had used the consulting firm on bonding or other voter-related campaigns. During public commentary time at the end of the meeting, Rorke continued his remarks. He said the hiring of Allerton-Hill was born out of the November 2012 defeat of AADL’s bond proposal to fund a new downtown library, and the initial interest in the consulting firm was for political purposes. The references from clients are all political, he noted. Rorke argued that the Allerton-Hill consulting contract is not a generic communications audit or project – but is instead a political project. Allerton-Hill provides political advocacy for the passing of public financing issues. He asked the board to review this contract and determine whether it is legal under Michigan law. In response to Rorke’s final public commentary, Barbara Murphy noted that the guidelines for public commentary indicate that no speaker can address the board more than once on the same topic during the same meeting. She felt that this rule should be followed in the future. 1. Persons who wish to address the Library Board may reserve time on any regular or special meeting agenda by calling 327-8311 by 5:00 p.m. of the weekday preceding the meeting. Persons who have not reserved time in advance may speak after those who have reserved time. 2. Maximum time for individual speakers will not exceed three minutes. 3. One speaker may yield his/her time to another if both have signed up and both are in attendance at the meeting. 4. No person may speak more than once on the same subject during a single meeting. 5. Citizens’ Comments at special meetings or study sessions will occur at the end of the meeting. Maximum time for individual speakers will not exceed three minutes. 6. Trustees, Director, and Administrators will not answer questions during Citizens’ Comments. The speaker may request a response in writing. Trustees may, with the permission of the Board President, ask a question of a speaker. No dialog will occur. 7. Individuals addressing the Board should take into consideration rules of common courtesy. Don Salberg said he was a long-time resident of northeast Ann Arbor. In November 2012, when the library’s bond referendum was put before voters, he noted, one of the issues that the library board raised was the need to do maintenance and upgrades to the downtown building, particularly to the electrical system so that there would be adequate power outlets for people to power their devices. The board had also indicated that there may be some ADA [Americans with Disabilities Act] compliance problems with the elevators, and that the boiler and cooling units might need to be replaced, he said. It was understood that these issues would be deferred, if there was a possibility that a new library might be built. However, the bond proposal was defeated. So eight months later, he said, he was urging the library to do the necessary maintenance and upgrades to meet the building’s needs that were identified before the vote. He said he is unaware whether any of these projects have been started. He hoped that requests for proposals (RFPs) had been put out to electricians. His understanding now is that the ADA issue might not be a serious problem, and that perhaps the HVAC system doesn’t need to be replaced. If money isn’t available through the operating funds, Salberg suggested using the library’s reserves. Robb Wolfe, executive director of the Ann Arbor Summer Festival, reported that the previous week concluded the festival’s 30th season – a comment that drew applause from the board and others attending the meeting. He thanked the library for its support of the 2013 season, and for the library’s participation. Hundreds of families enjoyed AADL’s Kids Rock concert series at Top of the Park, he said. Hundreds more visited the Kids Zone tent, where library staff and volunteers hosted interactive, hands-on activities with children and their parents. And the Superhero digital art exhibition involved hundreds of kids, projecting images onto Burton Tower. 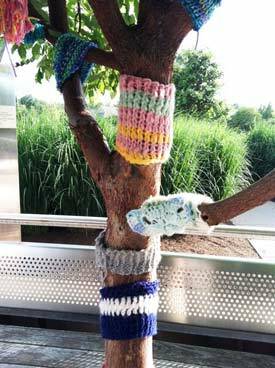 These projects, along with other workshops held at the downtown library, were admission-free, he noted. “They would not be possible without the library’s generous support.” Wolfe said he thinks of the Summer Festival as a big adventure that allows this community to come together and experience the arts and the world around them. “In many ways, I see that same sense of adventure in the work that the library does,” he said. Anna Onna Solomon, who lives in the Eberwhite neighborhood, recalled that she’d spoken to the board in the past as a new mom, thanking them for all that the library does for new families. She’s the program director for a local autism services agency, and part of its mission is to educate communities throughout Michigan. She and others often give free talks at the library, and one of their goals is to give similar free talks around the state at public libraries in other communities. However, she said, to their shock and surprise they learned that not a lot of communities offer the kind of talks that AADL offers. “I just took it for granted, until I started looking around the state.” She thanked the library for offering that unique service. Solomon also noted that she started playing the summer game, and has enrolled her son as well. 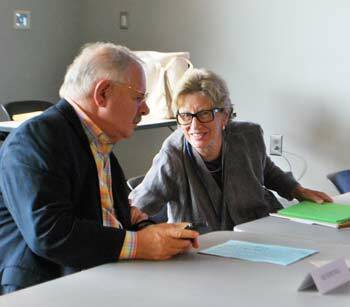 AADL trustees Ed Surovell and Prue Rosenthal. Donald Harrison commented on a recent event at the library – a screening of the film “Room 237″ about Stanley Kubrick’s “The Shining.” It was a fascinating, fantastic movie, he said. The event, which also featured one of the people interviewed in the film, had a great turnout, he noted. The room filled to capacity, so some people might say that the space was adequate. “But it was one of the most uncomfortable screenings I’ve been to in recent memory.” Harrison said he had to sit sideways, with his neck turned at an angle. So when talking about capacity, the discussion should include not just the number of seats, Harrison said, but also the quality of the venue. He said he’d think twice about going to a film if there were more than 30-40 people there, because the sight-lines are terrible. The AADL programming is great, but the focus also needs to be on the quality of the experience, he said. “And the summer game is awesome,” Harrison concluded. Lyn Davidge began by showing the board her badge from the recent annual conference of the American Library Association, held in Chicago. When she worked as a librarian at the University of Michigan, it was a fun custom in her department for people who went to conferences or on vacation to bring back trinkets for other staff members. Since she retired, she’s a very frequent user of AADL, “so you have become, more than ever, my staff here,” she said. Davidge described herself as an AADL board constituent, a taxpayer, and a member of the electorate that put the board in office. So it seemed appropriate to bring back some “goodies” from ALA, she said. Davidge encouraged board members to attend an ALA conference, if they haven’t done so recently. It’s a great way to experience the big picture and learn about the complex issues facing libraries, she said, and gain insights for possible collaborations among different types of libraries. She stressed that she’s not advocating for an expensive junket for all the board at taxpayer expense. But she hoped that her “goodie packet” would get them thinking about going independently. The packet included a red tag that said “Trustee,” which was distributed at the conference. She also provided information about two ALA divisions: (1) the Public Library Association, and (2) United for Libraries, the division for trustees. AADL summer game players can earn 500 points for reading this report. The code is the last word in the “New Collections” section of this article. Make that 1000 points, since the code in the photo also works. Kids Read Comics was actually founded and organized by FOUR amazing people, the three mentioned by Eli (Jerzy Drozd, Dan Merritt, and Dan Mishkin), AND Edith Burney Donnell, Youth and Teen Librarian at the Chelsea District Library, Ann Arbor resident and former AADL employee. Edith has been a part of KRC from the very beginning and deserves recognition for all her hard work. 12-19-12 Parker’s first email to Gagne after initial meeting with him includes links to ournewlibrary.com, protectourlibraries.org, and aadl building projects page. 2-20-13 Gagne makes presentation at Facilities Committee meeting. 4-13-13 Rosenthal email: “As chairs of Facilities and Finance I would like to ask you to join me” to meet with A-H.
Allerton-Hill Business Briefing: “helped win BILLIONS” in local funding campaigns. Allerton-Hill case studies all mention ballot issues, 2/3 regarding A-H’s role in changing a lost issue into a won issue. I heard that the library board also plans to use Allerton-Hill to conduct a survey which they hope will reveal how to convince the public to open their wallets. It would be better if the library simply accepted the results of the accurate survey which has already been completed at the ballot box. A large majority voted against big spending, conference centers, and tearing down useful buildings. The next library board election is in November, 2014. The best way to change policy at the library is to elect a new board. During the public speaking session at the library board meeting Donald Harrison complained about the poor sight lines while viewing a movie in the lower level multiuse room. I checked out the room and found it with rows of chairs in preparation for viewing a movie. The projection screen was retracted into its receptacle suspended near the ceiling. When the screen is fully lowered to accommodate projections, the screen remained above the heads of seated viewers, presenting no obstructions. I can not explain Mr. Harrison’s poor experience. In response to Mr. Salberg, indeed, you cannot explain the poor viewing conditions I experienced. I would recommend you attend a screening of a movie at the downtown library with actual people in attendance, not just an empty room getting set up. Even though I am 6′ tall, I could not see sufficiently over the 10 rows ahead of me. Throughout most of the feature length movie I leaned sideways into the aisle. I saw others visibly struggling to see at times, especially whenever text was presented at the bottom of the screen. And this wasn’t even a subtitled movie. The AADL’s programming was excellent. This was the MI premiere of a fascinating film with one of the main theorists in attendance for Q&A. Yet again, it was one of the most physically uncomfortable settings I’ve attended for a screening in recent years. My comment was not intended as a personal complaint, however, but to point out the importance of quality considerations in discussions about the needs of our library system as we move forward. The numbers are important, but so is the experience we’re providing people in our community. I’m even taller than Donald and had a similar experience when sitting in the back a another presentation that used the screen. We should all attend a movie presentation in the multipurpose room to assess whether the room design bothers me as much as it does the two of you. If the heads of the seated audience obstructs the projection perhaps the projector could be aimed higher. The library should not be a professional theater with stadium seating and professional audio equipment, such exist elsewhere in Ann Arbor. If needed larger viewing venues exist as auditoriums at many Ann Arbor Pubic Schools which likely can be reserved without cost and with available free parking. This is SO not helpful..
I’d like to see the AADL discuss reconfiguring the meeting room where the Board meets so that it is a more effective venue for public meetings, including the official meetings. The design is very bad so that the public is not well accommodated even to attend AADL or AAATA meetings. The room is quite large and is outfitted for CTN broadcast. With a better design, it could be available for large public meetings where information could be screened and events broadcast.